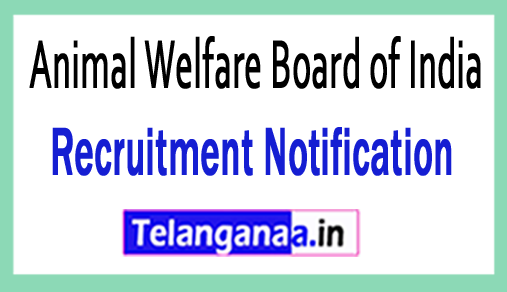 Animal Welfare Board of India has claimed a new career related advertisement under the name of AWBI recruitment to inform the most qualified and effective job applicants for 04 vacancies of Assistant Secretary, Stenographers, Head Clerk Co-Accountant. Eligible Job Hunters can apply for AWBI vacancy by submitting applications before the deadline within 20 days. Job seekers are advised to submit relevant documents with the AWBI application form before the deadline within 20 days. Most qualified and effective, job applicants can get all the important details about AWBI recruitment 2018, through this page, which is well prepared by the team of www.telanganaa.in. Education information: Those job hunters have applied the 10th / stenography knowledge / graduation degree from recognized university or institute. They are willing to apply for the above positions, which should be less than 45 years (post 1), 40 years (post 2), 35 years (post 3), 25 years (post 4). Salary Package: Successful recruitment candidates will get rupee pay. Rupees. 53,100 / - (post 1), Rs. 35,400 / - (post 2,3), Rs. 25,500 / - (Post 4) from recruitment organization. The engagement of the candidates will be based on their performance in written examination / interview which will be conducted by the recruitment committee of the Animal Welfare Board of India. Process of filling the AWBI application form? The first and most important step is to open the official site to you, which is http://www.awbi.org. A list of this latest opening link will open and the candidates will have to select the most appropriate link which will give more information about the AWBI vacancies to the full advertisement. Once the application has been successfully filled, the job applications should be sent with support documents and certificates to the address given below before the deadline. The application has to be sent latest: within 20 days. Click AWBI recruitment notification here.